New Acoustic Guitar Instrumental Video! 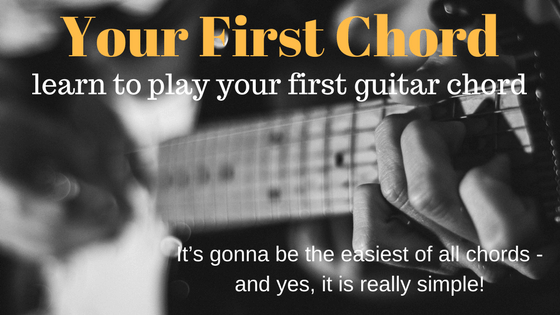 In this part you will learn to play your first guitar chord. It’s gonna be the easiest of all chords – and yes, it is really simple! It will take you 5 or 10 minutes to learn. You only need to use two fingers for this chord. All beginners start with it: this is probably the most used chord in guitar playing. Put your first finger on the second fret of the 5th string. Put your second finger on the second fret of the 4th string. Make sure you press enough with your fingertips (but not too much). Keep your fingers round (remember the spider shape). Strum down the chord with your pick. Pass through all 6 strings gently but bolded. There you go, you just created music! Shake your right hand – up and down. You could do a lot of stuff here. Strum the opposite way, then back to downstroke and so on. Try to make some rhythm of it. You can always use this basic techniques in your rhythm guitar practice in future. Hold the pick tight enough to keep from falling down into your guitar hole (it’s often a nightmare to pull it out), but no overacting. 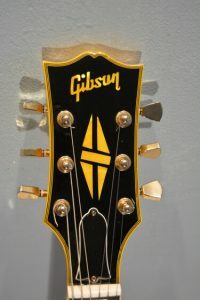 Make sure you properly hold the strings down to the frets without touching neighbour strings. It is a common mistake for most beginners to have this 3rd string “buzz” or having no 3rd string sound at all due to such interactions. Try to isolate the notes , make them clean and strum again. Each string needs to “breathe” independently.